Was autism ever a first advocacy priority for those promoting the idea that vaccines cause autism? Years back the evidence was rolling in debunking the hypotheses that the MMR and/or thimerosal in vaccines causes autism. At that time I naively wrote some colleagues in online writer’s community about how perhaps the groups that had been advocating about autism being a vaccine-induced epidemic would now become actual autism advocacy groups. They were at a fork in the road: become autism organizations or focus solely on vaccines. But acting like they were doing both was no longer going to work. One writer responded in a way that has stuck with me as he has been shown to be dead on right. Dr. David Gorski (who writes at Science Based Medicine among other places) was the colleague and I he said essentially: it has always been about the vaccines for them and it always will. Years later it’s obvious: Dr. Gorski was correct. I was wrong. And we are seeing good examples of that now in this measles outbreak as groups like Safeminds and, of course, the Age of Autism blog chime in with articles downplaying the dangers of measles. A prime example recently came on AoA from Mark Blaxill. Mr. Blaxill is largely responsible for the thimerosal scare of the past decade. He wrote a paper (published in the non peer reviewed Medical Hypotheses) Thimerosal and autism? A plausible hypothesis that should not be dismissed. It was junk when it was published, it’s junk now. 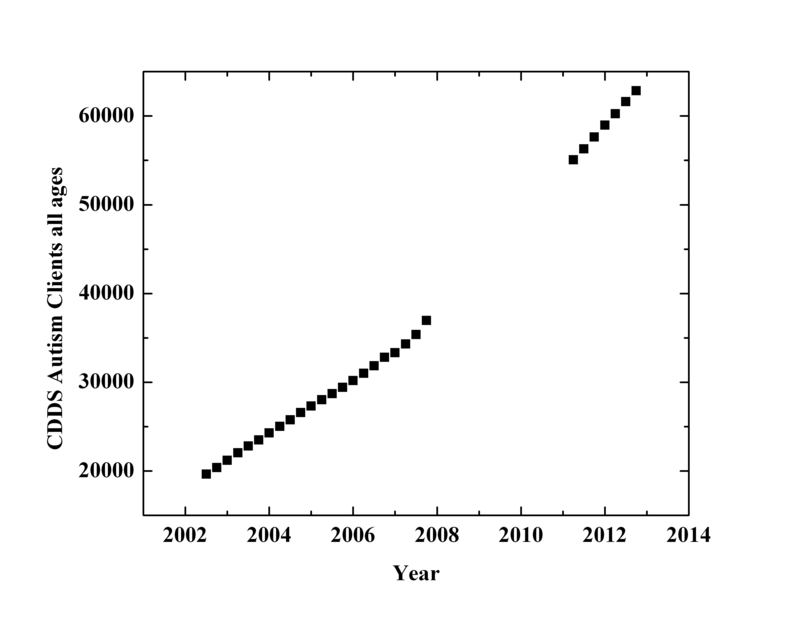 So that’s 10 measles deaths since 2000 and at least 7 measles deaths since 2005. 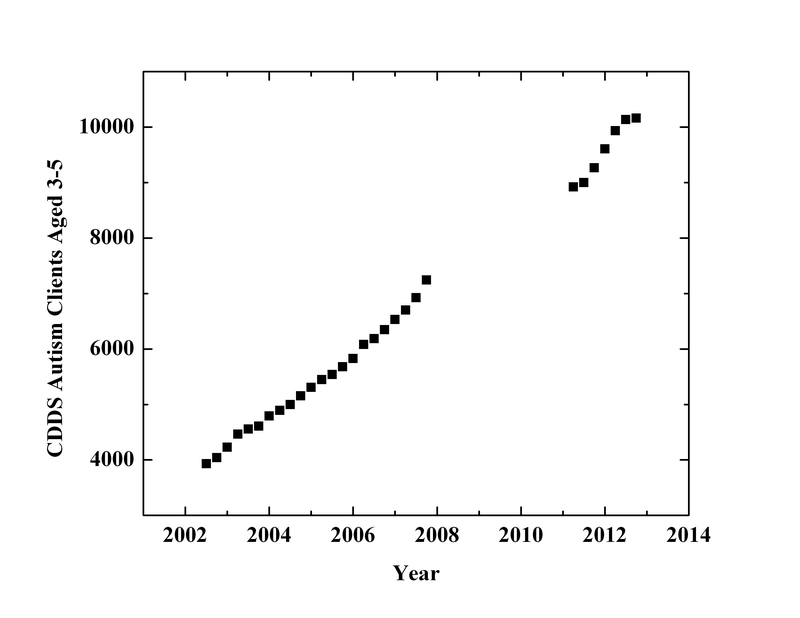 Why do people say that there have been no measles deaths in the United States in the past 10 years? Whether they are misinformed or intentionally trying to misinform people, they are wrong. One can confirm this on the CDC Wonder website. Here’s a screenshot. This isn’t about proving Mark Blaxill wrong on some point. Because in the end it doesn’t matter if it’s one death or ten deaths, it’s too many. 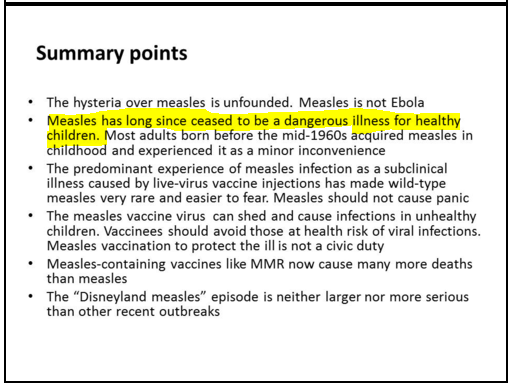 But I suspect 1 death or 10 deaths wouldn’t change Mr. Blaxill’s assertion that measles is a minor deasease. \Those 10 measles deaths Dr. Iannelli mentions are deaths that occur during the infection, usually from complications like pneumonia or encephalitis. But the thing about measles is that it can kill years later. There’s a condition called SSPE, Subacute Sclerosing Panencephalitis. You see, for some people, the measles virus enters the brain and stays there. And slowly kills. About 6 to 8 years after having measles, children with SSPE develop progressive neurological symptoms, including memory loss, behavior changes, uncontrollable movements, and even seizures. As symptoms progress, they may become blind, develop stiff muscles, become unable to walk, and eventually deteriorate to a persistent vegetative state. That’s 32 SSPE deaths since 2000 and at least 19 SSPE deaths since 2005. Why so many? Many of them can likely be attributed to the large number of cases associated with measles outbreaks from 1989 to 1991. There is no cure for measles infection. There is no cure for SSPE. One can read more about SSPE at the link given above or at a recent article at Science Based Medicine: SSPE: A Deadly and Not-That-Rare Complication of Measles. Mr. Blaxill includes a quote from someone in the 1963 who stated that measles is of “moderate severity” or “low fatality”. 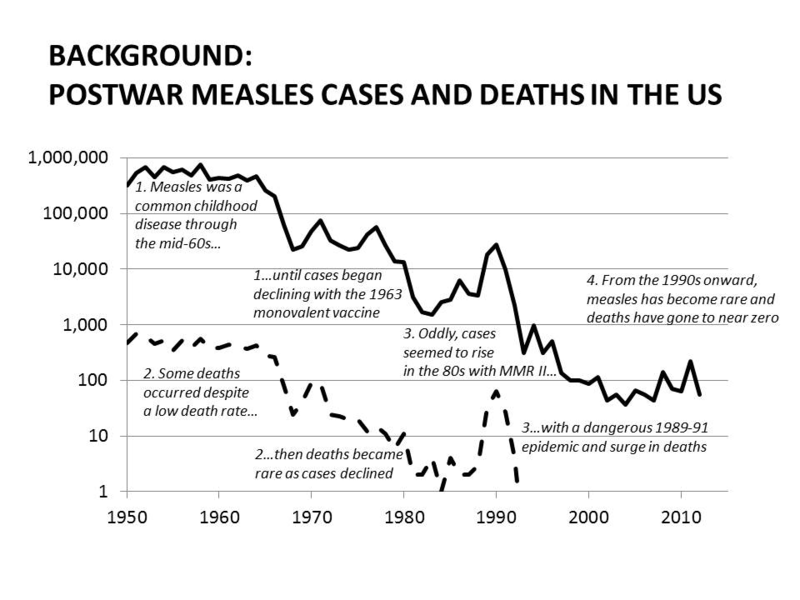 Perhaps to someone who lived through the early 20th century when measles was even more deadly, this might seem so. Perhaps. But not now. And how can someone ever use the phrase “self limiting” about a disease that can lead to SSPE? SSPE is only “self limiting” in the death of the patient. Here’s the thing that pops out of that graph: the death rate has remained constant at about 1 in 1,000 since at least 1950. Take a look at any datapoint in the deaths and go up a factor of 1,000 and there’s the infection rate. And that doesn’t account for SSPE deaths years later. Over the years I’ve found that Mr. Blaxill often takes an unreasonable and unfounded stance on issues. 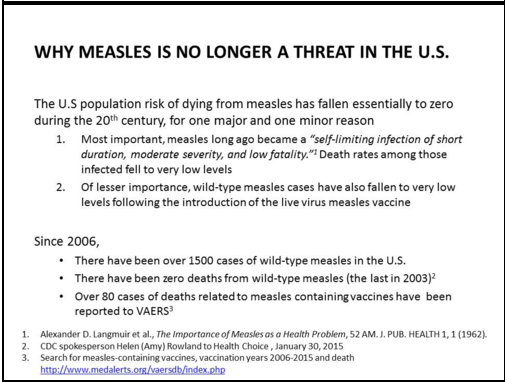 But since when is a death rate of 1 in 1,000 low enough to state “Why Measles is No Longer a Threat in the U.S.”? For comparison, Mr. Blaxill informs us that there have been 80 deaths attributed to measles containing vaccines reported to VAERS (the Vaccine Adverse Event Reporting System) in the past 10 years. He ignores, as most people do who use VAERS in this manner, to include the disclaimer one must acknowledge in order to access VAERS data, which concludes that VAERS data do not imply causality. But let’s for the moment assume that every report to VAERS is causal. 80 deaths. There are about 4 million babies born in the U.S. each year. About 90% get the MMR vaccine. Twice. Over 10 years. That’s nearly 80 million doses of MMR vaccine administered. So, even if we take each report to VAERS as causal, that would be 1 death in 1 million doses. 1 death in 500,000 infants. This is a huge over estimate given the assumptions, but let’s do the difficult: compare these numbers. To Mr. Blaxill 1 in 500,000 is too many, but 1 in 1,500 is “low fatality”. Even using the Mr. Blaxill’s flawed assumptions, his logic doesn’t make any sense. Measles has ceased to be a dangerous illness? Seriously? First, the idea that we can accept 1 out of 1000 people dying due to measles is just astonishingly bad advocacy. For that point alone we in the autism community need to distance ourselves from Mr. Blaxill and people like him. These irresponsible actions are not the actions of the autism community. In New Jersey, 1 in 29 boys born in 2000 were diagnosed autistic. What’s going on? Why are so many American children sick? The message he had for many years was that autistic children are sick. Not healthy. His former organization (Safeminds) would be quick to point out a number of conditions that are more common in autistics than in the general population. Since even by his own definition autistics are not “healthy”, why should we let measles return in force to the U.S.? Of course it is Mr. Blaxill’s failed hypothesis that vaccines are making children “sick”. But let’s consider this very real point: the developmentally disabled are more likely to become sickened by infectious diseases and they are more likely to die (Why vaccination uptake matters to the autism community). And that’s ignoring the fact that a large fraction of autistics are also epileptic. And a huge trigger for seizures is infectious disease and the prolonged fever that comes with it. Perhaps Mr. Blaxill is unaware of the term status epilepticus, the situation where someone gets into a state of constant seizures. And, yes, this can be brought on by infection. Or perhaps Mr. Blaxill has forgotten the emphasis his community placed on mitochondrial disease and autism just a few short years ago. From a U.C. San Diego Metabolic Deseaese Center website, the paragraph: What is Mitochondrial Disease? If a child is stricken with a catastrophic disease affecting three or more organ systems, or if a child has been afflicted with a relapsing disease that affects two or more organ systems and leads to slow but measurable deterioration, he or she may have a mitochondrial disease. At times, mitochondrial diseases can cause isolated symptoms. These may include unexplained seizures, low blood counts, dystonia (abnormal muscle tone or spasms), blindness, deafness, dementia, ataxia (stumbling or tremors), cerebral palsy, heart failure, or progressive muscle weakness. More often, however, several organ systems are affected in sequence, one faltering or failing after another. Good periods are frequently punctuated by abrupt deteriorations that are caused by simple infections. For children with mitochondrial disease these infections can be life threatening, and leave them with deficits that cannot be recovered. Emphasis added. Some fraction of our population does have mitochondrial disease. Allowing diseases like measles back would put this community (as well as those with mitochondrial disease without autism) at huge risk. I’d like to say that Mr. Blaxill, like many in the “autism is a vaccine-induced epidemic” camp, has lost his way. A very valid question is whether Mr. Blaxill and his colleagues were ever on the path of autism advocacy. Was it always, as Dr. Gorski opined, about the vaccines? While I’ve entitled this article “Was autism ever a first advocacy priority for those promoting the idea that vaccines cause autism?”, in the end motivations are secondary. Mr. Blaxill’s actions are and have been irresponsible. They are an example of the actions of a group of faux autism advocates that have a history of irresponsible actions. Not just to public health but to the autism communities. I recently attended a talk where the speaker showed autism prevalence by age group for a large HMO in California. 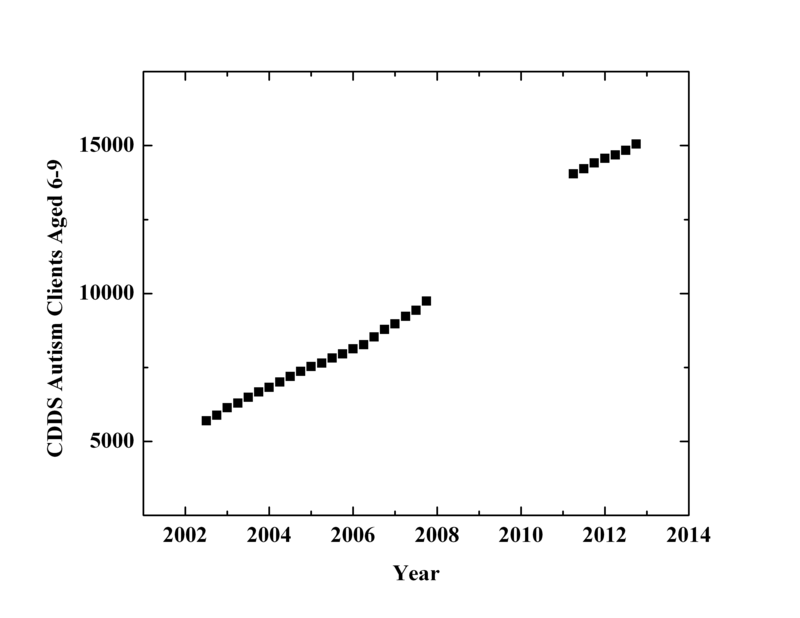 The administrative prevalence (fraction of people in the HMO identified autistic) was still going up as of 2010, and the speaker indicated this trend continued to 2012. California is an interesting case study because not only was thimerosal removed from vaccines along with the rest of the U.S. starting in the late 1990’s, but the state enacted a law which required that pregnant women and children under three be given thimerosal free vaccines from 2006 onward. So, with the exception of an an exemption in 2009 and another one right now, even the influenza vaccine in thimerosal free. I bring this up because it is a common argument that somehow the exposure from the flu vaccine is keeping the rate climbing, even though at most this is a lower exposure than that from the 1990’s pediatric vaccine schedule. This all said, the talk made me dive back into looking at autism prevalence. I decided to finally write about the fact that the autism prevalence in Denmark is higher post thimerosal than while thimerosal containing vaccines were in use. This is completely unsurprising, but a myth has been propogating that it came down and that fact was being hidden. As it turns out I also checked back with what once was the most common source of autism data for the armchair epidemiologist: the California Department of Developmental Services (CDDS). (I admit one could argue that Special Education data are the most common source for the armchair epidemiologist). The CDDS provides services to disabled Californians and keeps and makes public statistics on their client base. For a long time, every quarter they would come out with a report. For a long time, every quarter these reports would be followed by announcements about how the data showed that vaccines cause autism. One of the people you could always count on was David Kirby (author of the book, Evidence of Harm: Mercury in Vaccines and the Autism Epidemic: A Medical Controversy, and basically a PR man for some of the vaccine-causation groups). 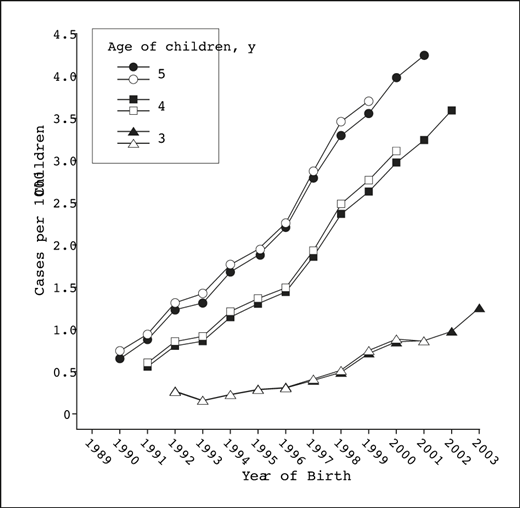 Mr. Kirby went so far as to claim that these data were the “gold standard of autism epidemiology”. Well, the data had their uses (such as identifying and quantifying some of the social influences behind the increase) but it is not an easy task to get results from them. The idea that they represent an accurate count of all those with ASD’s (or even accurately account for all individuals with autistic disorder) is a stretch. Stay tuned. If the numbers in California and elsewhere continue to drop – and that still is a big if — the implication of thimerosal in the autism epidemic will be practically undeniable. The reason is that 5 year olds in 2007 were born after the removal of thimerosal from vaccines. Their exposure to thimerosal was much less than kids in the 1990’s. If the “thimerosal caused an autism epidemic” idea were true, the rates would have to drop. They should drop back to pre-1990 (actually pre 1980) levels if thimerosal were the main, or even a main, cause of the rise. My recollection is that Mr. Kirby did later backpedal and claim that we would have to wait until some much later date, but it was a weak argument (even by David Kirby standards). 1) A gigantic plume of coal smoke from Chinese power plants has settled on California, depositing lots of mercury and therefore causing the autism numbers in the state to continue to grow. 3) Cremations (!). The burning of dead bodies with mercury amalgam in their mouths has added even more mercury to the air. It was a hail Mary pass, to be blunt. Lot’s of handwaving and ignoring the facts. In 2007, the CDDS changed the way they assessed and counted their clients and they stopped publishing the quarterly reports. As you can imagine, many claimed this was part of a conspiracy to hide the fact that the autism rates were declining in California. And with that the quarterly ritual of misinterpreting and deconstrucing the data came to an end. Which is all a very long way of saying: years ago the evidence was against the thimerosal/epidemic idea; it is even more clear now. For years we heard Mr. Kirby and others talk about how those responsible should step up and admit what happened. Well, the fact is they did. Now it is time for those who promoted the mercury notion to step forward and show they have the guts to admit they were wrong. Because they were. Clearly wrong. It would take a lot of guts to step forward and admit the mistakes. Even though their influence has waned, it would help the autism communities. While I have focused on David Kirby in this discussion, the list is much longer of people who should step forward. I’m not going to hold my breath.